The most striking thing about this press render is that the entire phone is colored gold, drawing indisputable comparisons to Apple's "champagne" iPhone 5s color option. Presumably other colors will be available. Beyond that, you can see dual cameras on the back, a double LED flash setup, virtual navigation buttons, and a refreshed HTC software package that looks like KitKat (note the transparent notification and navigation bars). All of these points line up with previous leaks, though we still don't know the specific purpose of the secondary rear camera. Beyond that, the design looks almost identical to the current HTC One, complete with an all-metal build, somewhat chunky screen bezel, dual front-facing speakers, and a slightly more dramatic curve on the device edges. We don't have reliable specification information, but one leak early this month claimed that the New One will use a 5-inch 1080p screen and a 5-megapixel front camera. 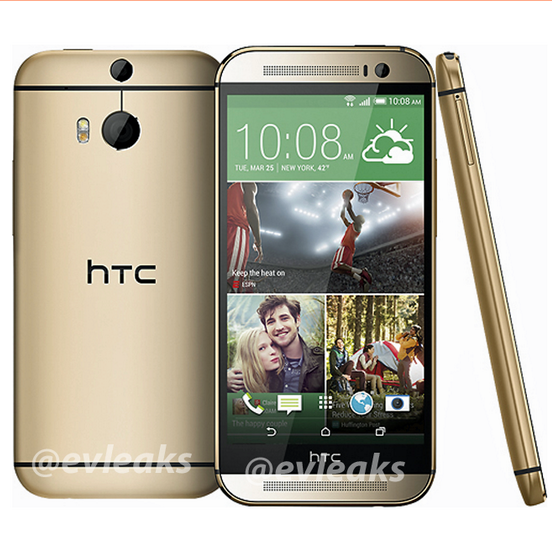 There have also been leaks of an "M8 Mini," presumably the follow-up to last year's HTC One Mini. HTC is expected to reveal its new flagship at a March 25th press event being held in London and New York.